My mother-in-law gave us her 1987 Acura, 80K miles, which needed a bunch of work: broken constant velocity boot, malfunctioning EGR valve (and subsequent inability to be smogged), headlight alignment off, smashed passenger-side mirror, broken turn light plastics, and serious rust damage and water leakage in the trunk. Having two cars was great because we could bring the kids to their respective age-appropriate events and still quickly get back together for family time. But the car needs work, a smog check is now required, and there are no steel beams or other safety equipment on this puppy. 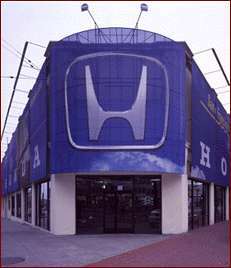 Still, I bring it to the Honda of San Francisco - the maintainers of the car - to have the EGR and smog done. On the way out I choose the exit which brings me through the showroom. What do I see? 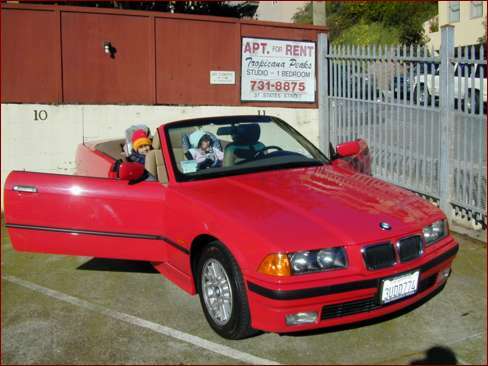 A beautiful red BMW convertible, sand leather interior; shiny as a new penny. A salesman chats me up, and as I make it clear that this would be a discretionary purchase and not one I'm in need of, we talk of a price many thousands of dollars under the blue book value. 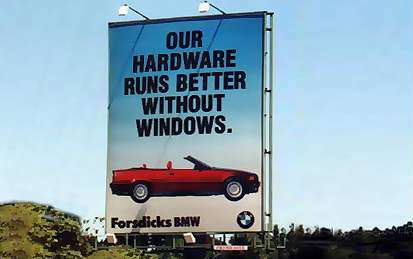 Long story short, I have my mechanics, the one who have maintained my 1995 BMW 318is since it was a baby, give this car a going-over. They report that it's very clean, possibly needing a replacement of the original battery. So I buy it. Now Rose can use the black Bimmer to ferry the kids around when I'm at a client. Where will the Acura go? Don't know. Hopefully to a friend who doesn't have small children. Here's our first picture of the car, with Isaac and Lila all bundled up against the sun and the wind It's parked in the lot of the Tropicana Peaks apartment complex just down the street from our cottage. Now it's time to go somewhere. 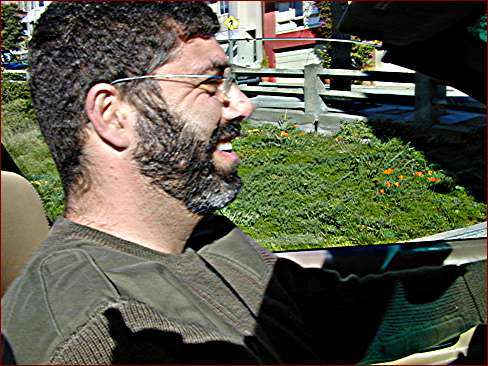 Here I am, courtesy of Rose, as we take that serpentine turn on Levant Street, that tiny connector between States Street and Roosevelt Avenue. I'm a happy boy. And what I think might be Rose's first [unintentional] panorama: the family en route. Lila is smiling, but Isaac is in that four-year-old cant-make-me-smile phase.